GREEN BAY, WI – FEBRUARY 11, 2019 – The N.E.W. Zoological Society Inc., an independent, nonprofit 501(c) 3 organization that supports the NEW Zoo in Green Bay, was selected to participate in the second annual Give BIG Green Bay initiative. Give BIG Green Bay is online fundraising event presented by the Greater Green Bay Community Foundation and the Green Bay Packers Foundation to celebrate and support local nonprofits. The Green Bay Packers Foundation is matching every donation to make a bigger impact. Forty Brown County area nonprofits were selected to participate in this community-wide crowdfunding event that takes place over 24-hours, starting at noon on Wednesday, February 20 and ending at noon on Thursday, February 21. Thousands of donors are anticipated to show their support through a simple online giving platform via giveBIGgreenbay.org. The website makes it easy to learn more about the work of participating nonprofits and to donate, at any level. “We’re thrilled to again take part in such an impactful, memorable fundraising event with The Greater Green Bay Community Foundation and the Green Bay Packers Foundation,” said Gary Ehrbar, President, The N.E.W. Zoological Society, Inc. “This initiative will help enable us to continue offering exceptional animal, education, and conservation programs for the community.” Last year’s fund raiser netted the Society over $27,000. The N.E.W. 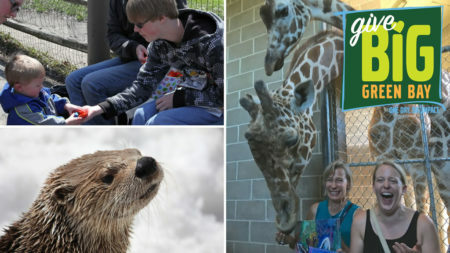 Zoological Society’s mission is to provide an exemplary visitor experience and to assure a clean and safe environment for animal collection, staff, and guests from all over Wisconsin and the region. The nonprofit supports the community through committed development of conservation programs. Through its programs, The N.E.W. Zoological Society aspires to spur visitors to make choices and take actions to conserve our planet’s environment and wild places. More importantly, the organization ensures that the wonders of wildlife remain accessible to the entire community. Give BIG Green Bay hopes to create a swell of excitement around the good work agencies do for the local community and provide a new channel for donor support. The online giving event was designed to transform the way the local community thinks about and contributes to Brown County charities. “Our overarching goal for this event is to advance the NEW Zoo’s mission of connecting people with wildlife. Through Give BIG Green Bay, we can raise funds that are focused on providing meaningful, engaging opportunities for visitors from across Wisconsin and our surrounding regions,” Ehrbar continued. About the N.E.W. Zoological Society, Inc.